ISAIAS AFWERKI, President of Eritrea, said the Assembly was meeting at a time of opportunities to better the lives of hundreds of millions of people, but the favourable prospects must be weighed against such profound dangers as the global economic crisis, massive unemployment and recurrent famine, among other ills. While none of those problems was new, there was no denying that the malaise seemed much more intractable today than in the past. “The reality is that the problems we face are systemic, were accumulated over many years and decades, and require systemic and structural change,” he said. In that regard, Eritrea looked to China, India, Russian Federation, Brazil and other emerging and re-emerging Powers to show more leadership. He said 2011 had seen “stirring and courageous” efforts to effect fundamental change in many countries. While North African and the Middle East had been the epicentre of that movement, it was not limited to the Arab world or to developing nations. There was the same sense of anger in the developed world, at Governments beholden to a “small minority with special interests”, he noted, urging acknowledgement of that “stark global reality”, and calling for the empowerment of the people, especially youth, to work for a better future. The United Nations had already become “hopelessly outdated” and risked irrelevance, he said, adding that there was an urgent need for real reform and a comprehensive transformation, rather than a mere tweaking of the system. A critical element must be the strengthening of the General Assembly, he emphasized, saying that, as long as it was deprived of real decision-making powers, the world body would remain unrepresentative. Despite the hope of the early decolonization era, the past five decades had been largely disappointing, he continued, pointing out that Africa continued to struggle in a difficult and complex international environment. 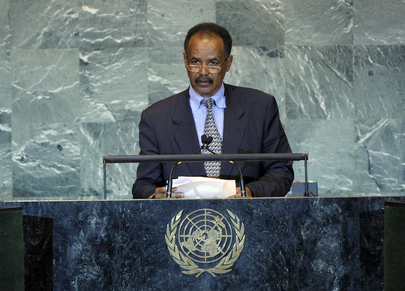 While the continent would not shun partnerships, it would give primacy to its own capabilities and to cooperation at the continent and subregional levels, he emphasized, saying that Eritrea was committed to economic development and integration into the Horn of Africa and Red Sea subregions. It would also work to revitalize the Intergovernmental Authority on Development (IGAD), while working with Sudan and South Sudan, with which it had long-standing ties. On Somalia, he said it was abundantly clear that a new approach was needed. Since rebuilding the country and its institutions was the central goal, it was imperative to engage and bring all stakeholders into a Somali-owned political process, including the Governments in “ Somaliland” and “Puntland”. As for the Middle East, he reaffirmed Eritrea’s support for the right of Palestinians to self-determination and an independent, sovereign State. He also upheld Israel’s right to live in peace and security within internationally recognized boundaries.